University hospitals are known as centers of high-quality training and patient care, but many boast exceptional aesthetics as well. The university hospitals listed here were chosen primarily for their aesthetic appeal, though all are recognized for healthcare leadership in their community and beyond. In terms of aesthetics, many have received accolades from architectural organizations like the AIA, and a number have been awarded LEED certification from the U.S. green building Council as well. We narrowed this list from an initial group of more than 100 worthy facilities. 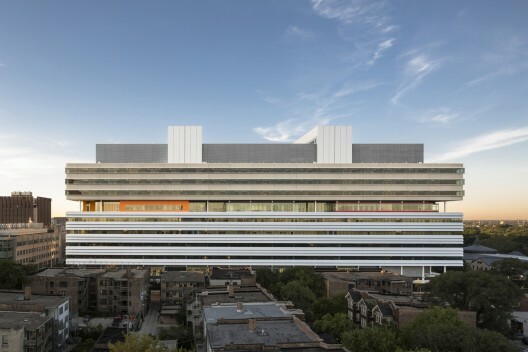 Located in Minneapolis, the University of Minnesota Amplatz Children’s Hospital won an AIA National Healthcare Design Award in 2013 and was planned by Richard Kobus of Tsoi/Kobus Associates. The six-story structure with its stunning façade, composed of multi-colored stainless steel panels, was designed with the intention of establishing an ideal environment for children’s healthcare. With a decentralized floor plan and the interior theme, Passport to Discovery, the hospital’s innovative layout reduces travel time for nursing staff and incorporates a new standardization of room organization to aid in waste reduction and ease of communication. The state’s first eco-friendly hospital, Amplatx Children’s Hospital also features a green roof. Designed by world-renowned architect I.M. Pei, the Mattel Children’s Hospital at UCLA is part of the newly constructed Ronald Reagan UCLA Medical Center. Originally founded in the 1950s, generous donations by Mattel Incorporated have helped pave the way for a new facility dedicated to the health and wellness of children. The facility’s most prominent feature includes the “Welcome Wall,” a 48×12-foot wall designed through a partnership between Hunt Design of Pasadena and Electrosonic Incorporated. A focal point of the hospital, the “Welcome Wall,” incorporates digital wallpaper, projected video, and plasma screens to create visual stories about the hospital and its patients. Part of the Duke University Medical Center, the Duke Medical Pavilion was completed in 2012 as part of a major renovation of the Duke Medicine campus. Through collaboration between Perkins and Will, Cooper Robertson, and Tsoi Kobas, the Pavilion was the winner of the AIA Charlotte Landscape People’s Choice Award. The building, which is pursuing LEED certification, includes a rainwater harvesting system, green roof, and a tree canopy to reduce the building’s internal temperature. The expansion project also incorporates 160 new patient beds and over a dozen new operating rooms. Winner of a 2011 National Healthcare Design Award in the “Unbuilt” category from the American Institute of Architects Academy of Architecture for Health, the UCLA Outpatient Surgery and Oncology Center is seeking LEED Gold certification. With an intention to create a less clinical and more natural healing environment, Michael W. Folonis Architects created a natural lighting and ventilation system to improve the relationship between the facility’s interior and exterior environment. This relaxing and elegant design also won the 2010-2011 AIACC Award for Architecture and the 2010 Westside Prize from the Westside Urban Forum. Designed by CannonDesign as part of the downtown Buffalo rejuvenation project, the Kaleida Gates Vascular Institute/Clinical Translational Research Center won an Honor Award for Interior Architecture from the AIA Western New York. 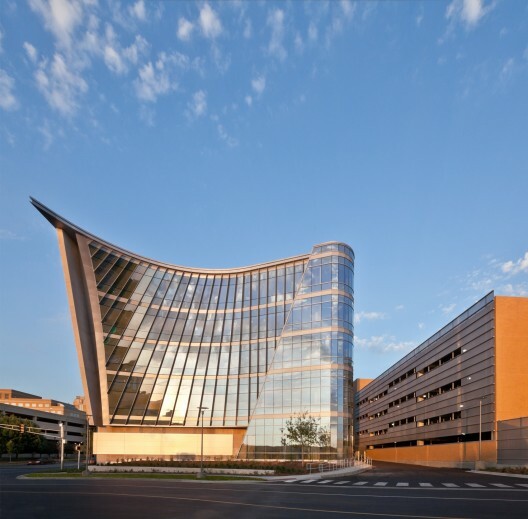 The facility’s design incorporates 10-stories that sandwich two collaborative floors between the Vascular Institute on the lower portion of the hospital and the Research Center, which is located on the facility’s upper floors. This “collaborative core” allows for cross-disciplinary exchange and incorporates state-of-the-art laboratory and research areas, as well as a number of hotel-style private rooms for patients and their families. Designed by Smith Group JJR to integrate the university’s cancer research and care centers, the UC Davis Comprehensive Cancer Center is one of only 41 cancer centers in the nation to have received designation as a National Cancer Institute. With large windows and open spaces, the unique facility has dedicated an entire floor to the treatment of pediatric cancers. The hospital includes play areas, courtyards, and outdoor spaces to encourage relaxation. The facility was given a Merit Award from the Northern California Chapter of the International Interior Design Association. After nearly ten years of planning, the building opened in 2012. Part of the University Health Network, or UHN, Toronto’s Krembil Discovery Tower is the home of one of North America’s most prominent neuroscience research facilities. Built through collaboration between Stantec Architecture and NXL Architects, the Krembil Discovery Tower also houses the Toronto Western Research Institute. Notable elements of the facility include a “Sky Lobby,” which is comprised of multiple glass enclosures that are intended to promote interdisciplinary research. The building’s sustainability features include ample bicycle parking and onsite showers to promote alternative means of transportation. 75% of the construction waste from the project was recycled. Built to withstand hurricane winds and floods, New Orleans’ University Medical Center will serve as a unique academic hub for numerous institutions including Louisiana State University, Tulane University, and Dillard University. Intended to replace facilities damaged by Hurricane Katrina, the new UMC will help revitalize the city’s medical center and will encompass over one million square feet. Designed through collaboration between Blitch Knevel Architects and NBBJ, the hospital’s unique features include over 400 new beds, and the region’s only Level One Trauma Center. Functioning as the center point of BioDistrict New Orleans, the UMC is set to open in 2015. Designed and completed in 2004 by Architectural Nexus, the University of Utah Orthopaedic Center received the Intermountain Contractor Silver Design Award in 2005. It serves as the central nucleus for the university’s research lab, education space, medical library, and administrative space. Considering patient care and experience, the designers created inpatient rooms to take advantage of natural light, and considered ease of movement for visitors and staff members through the use of giant curved glass walls. The university medical campus is also home of the Huntsman Cancer Institute, which was also designed by Architectural Nexus and was completed in 2011. Located in Baltimore and designed by Odell Associates, the Sidney Kimmel Comprehensive Cancer Center at Johns Hopkins Hospital is designated by the National Cancer Institute. Specializing in clinical and laboratory research, education and community outreach, the center offers an innovative and state-of-the-art facility to patients and their families. Challenged with honoring the neighboring historical buildings that surround the hospital, Odell Associates took the facility’s primary design inspiration from many of the city’s significant architectural landmarks including the Billings Building and the original Wilmer Building, which has recently been replaced. The light-color bricks that cover the building’s façade and the white trim pays homage to the original 19th century architectural beauties. Winner of Building Better Healthcare UK named the University Medical Center of Princeton Plainsboro the Best International Healthcare Design Project in 2013. Noted as “inspirational,” by panel judges, the facility was designed by HOK and RMJM Hillier. It includes private patient rooms, sustainability features, and a 50% increase in square footage over the hospital’s previous residence. Eco-friendly elements of the design include shading to control sunlight and a 25% reduction in energy use when compared to a similar building that uses a traditional energy infrastructure. Ninety percent of the building’s occupied spaces receive natural light and in 2013, the facility was awarded an Engineering Excellence Diamond Award in the Building/Technology Systems category by ACEC New York. 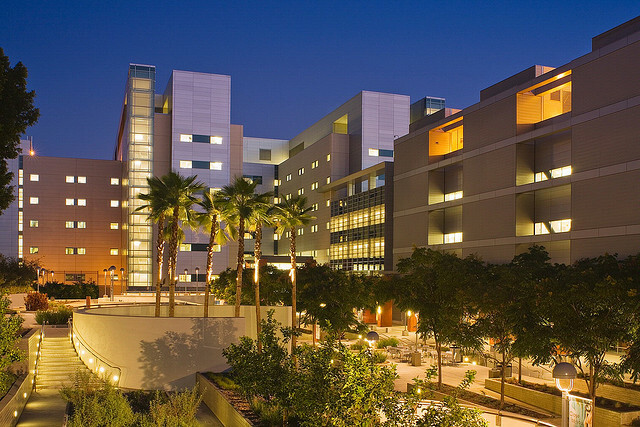 Originally established in the late 19th century, the Los Angeles County and University of Southern California Medical Center recently opened a new facility in 2008. 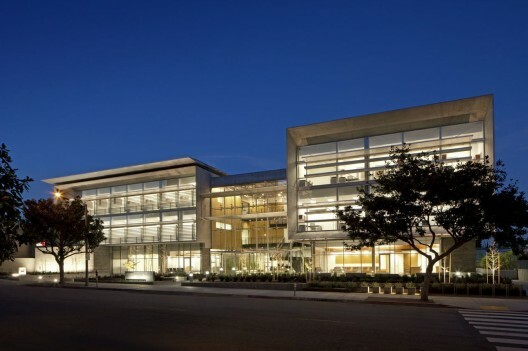 Designed through a partnership between HOK Architects and LBL Architects, the project was one of Fast Company’s 29 Best Buildings in Los Angeles in 2009. Updated to meet current seismic standards, the hospital also contains 10-acres of garden landscaping designed by Rios Clementi Hale Studios. With indoor and outdoor plantings, the facility’s landscape design brings nature into an urban setting, which is intended to help aid patient healing. Unique to this particular project, an Outpatient Garden provides an outdoor lobby area for visitors and staff to inspire relaxation and reflection. Harvard Medical School’s teaching hospital was founded in 1811 and is one of North America’s oldest medical facilities. The Lunder Building, designed by NBBJ recently, won a Citation of Merit from Healthcare Design Magazine. Seeking LEED Gold certification, the Lunder Building is comprised of 14 floors and increases the current hospital space by 150 beds and 28 operating rooms. Impressive considering the site’s small urban footprint, the building has a significant amount of green space and is frequently described by patients and staff as warm and inviting. Part of the OHSU Schnitzer Campus, the Collaborative Life Sciences Building at the Oregon Health Sciences University sits along Portland’s picturesque southern waterfront. Designed through collaboration between SERA and CO Architects, the facility is on target for LEED Platinum certification. Unusual and inventive, designers created brightly painted stairways to encourage walking and discourage elevator use. Oil-drilling pipes were salvaged to serve as building foundation piles. A large glass atrium encourages collaboration and openness between disciplines, researchers, and hospital staff, and eco roofs aid in storm water management and structural cooling. Designed by IBI Group Architects and Martin Marcotte Beinhaker Architects, Montreal’s McGill University Health Centre is seeking LEED Silver certification. Intended to establish itself as a healing environment focused on patients and their families, the Centre’s unique design offers ample natural light and a distinctive glass-encased interior with garden views. The facility also houses a Zen garden and playground as well as acres of green space to facilitate and inspire health and healing. Designers also sought to create an interior structure that includes intuitive way-finding to improve patient and visitor experience. Located on the Salt Lake City’s campus of the University of Utah, the Huntsman Cancer Institute expansion project was completed in 2000 and was designed by Architectural Nexus. Awarded Project of the Year in 2002 by Intermountain Contractor, the facility contains six floors with rare features like a cancer learning center for patients and their families, a lecture hall, and a restaurant. The institute was given an additional $50 million from Jon M. Huntsman to begin the design and construction of a children’s cancer research facility is set to begin in 2014. Designed by AIA Colorado and AIA Denver Firm of the Year, Davis Partnership Architects completed the Anschutz Cancer Pavilion in Aurora, Colorado in 2000. It was the first building constructed on the Anschultz Medical Campus. The facility won the Rocky Mountain Chapter Award of Excellence in 2000 from the American Concrete Institute. With a three-story atrium and a second-floor outdoor garden, the design includes abundant windows to allow for regular daylight access and reduce dependency on artificial lighting. Neighboring buildings on campus include the Children’s Hospital and the Nighthorse Campbell Native Health Building. Located in La Jolla, California and part of the UCSD Health System, the Jacobs Medical Center is set for completion in 2017. The facility will house four hospitals, and will be seeking LEED certification. Designed by CannonDesign, the center’s design inspiration comes from a desire to create a healing environment that brings the natural environment inside. The 10-story expansion and renovation will include a healing color palette and a calming interior to help in the reduction of patient pain levels. With ample natural light and over 500,000 square feet, the structure will focus on cancer care and the treatment of women and children. The University of Washington Medical Center Surgery Pavilion in Seattle offers outpatient surgical care and was designed through collaboration between NBBJ and Keating Khang Architects. The structure’s notable features include a sloped glass curtain wall and a glass pedestrian bridge that links the Surgery Pavilion with the Medical Center. A metal roof and a three-story white spiral staircase combines with multiple skylights to create a unique interior space filled with light. Overlooking a city park, patient rooms are enhanced with the city’s natural beauty, and the design’s overall focus on light and air give the facility a modern feel. Just a short walk for the White House, The George Washington University Hospital was originally established in 1824. A new facility opened in 2002 and was designed by Smith Group JJR. It was inspired by Washington’s rich architectural and cultural history. Specializing in cancer, cardiovascular, and robotic surgery to name a few, the facility combines state-of-the-art research with top-notch patient care. With over 350 beds and a Level 1 Trauma Center, the hospital houses 400,000 square feet, and cares for nearly 75,000 patients yearly. 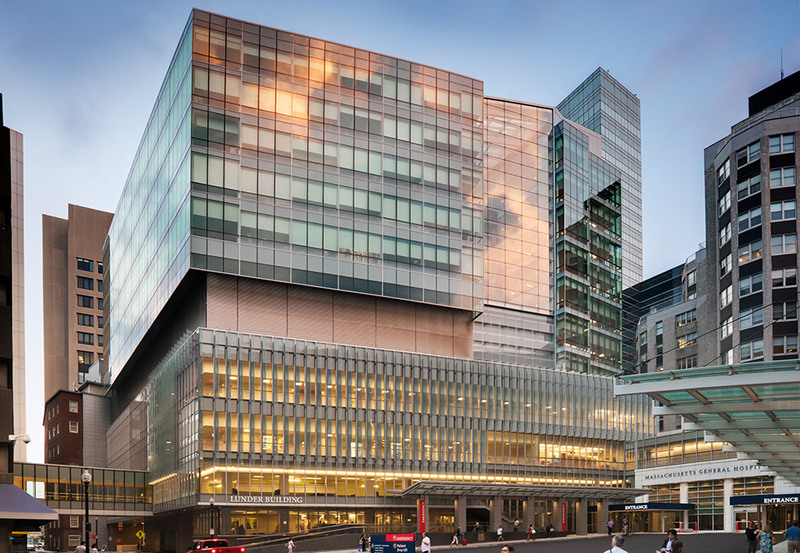 Designed by Diamond and Schmitt Architects Inc., the new Peter Gilgan Centre for Research and Learning at Toronto’s SickKids was completed in 2013 and is believed to be the world’s largest child health research tower. Rising 21-stories high, the 778,000 sq. ft. facility is is centered around six thematic research neighborhoods, each with two- and three-story open collaborative space featuring a dramatic sequence of stacked curvilinear bay windows. The facility is currently seeking LEED Gold certification and natural light fills 90% of the building’s occupied space. Sustainability features include a 50% reduction in water use, the use of low-VOC products, and a 75% waste diversion from landfills. 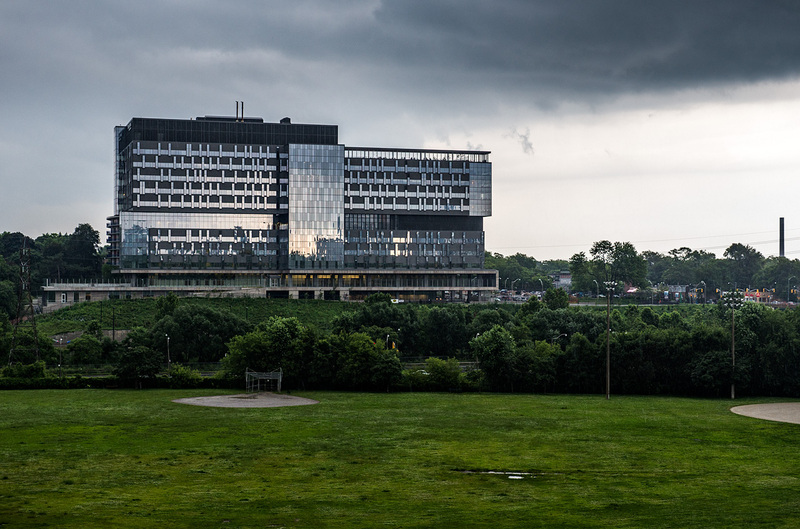 This beacon of the Toronto skyline contains laboratory spaces, a retail space, and a 250-seat auditorium to enhance collaboration and provide optimum solutions for children’s health. Bridgepoint Health was designed through collaboration between Diamond Schmitt Architects, HDR Architects, KPMB Architects, and Stantec. Completed in 2013, the facility is the largest healthcare facility in Canada covering 680,000 square feet. A Pug Award has been awarded to the health center. The facility’s notable features include the use of recycled-content materials, glass walls, and an outdoor terrace. The building’s labyrinth and rooftop garden were designed to bring patients out of their rooms and into an environment intended to inspire health, wellness, and illness management. On track for LEED Gold certification, the Brigham and Women’s Hospital of Harvard Medical School is set for completion in 2017. Along with Massachusetts General Hospital, “The Brigham” is part of Partners Health Care, the state’s largest healthcare provider. The design by NBBJ will bring daylight and patient-modulated sunlight into the facility. It will also include research laboratories and clinics as well as a 400-car parking garage. Winner of the 2013 AIA Healthcare Design Award for Innovations in Planning and Design Research, the new building will help stimulate interdisciplinary research and collaboration through its open floor plan and its focus on one-stop care. Located in Cleveland, Ohio, the Seidman Cancer Center was designed by CannonDesign and Array Architects to create a healthcare space that offers patients and their families a warm and comforting environment. The design’s striking exterior is composed of multiple curves that lend themselves to an interior space flooded with natural light, leaving behind sterile clinical hospital spaces of the past. Green roof tops, a healing garden, and floor to ceiling glass panels give patients access to nature, and roof top solar panels and water-efficient landscaping contribute the facility’s sustainability. Awarded the Chicago Athenaem American Architecture Award in 2008, the center gives patients an opportunity to heal in a contemporary, eco-friendly setting. Designed by Perkins + Will and a recipient of the 2012 Building Team Awards Platinum Award, the Rush University Medical Center was completed in 2011 as part of a campus-wide makeover. 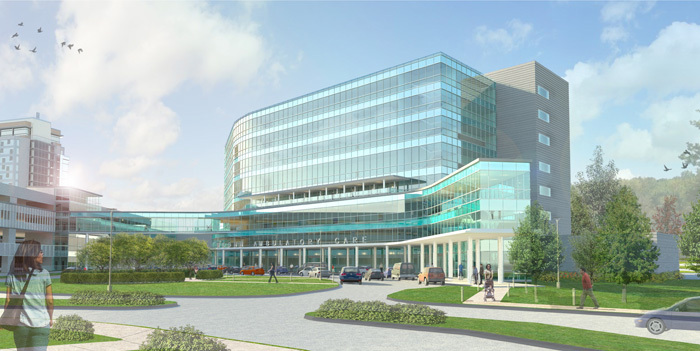 The enormous butterfly-shaped structure incorporates 800,000 square feet and features a landscaped roof garden, skylights, and over 380 new patient rooms. Achieving LEED Gold certification, the facility’s design allows for ample daylight as well as high quality air circulation throughout the facility. Specifically designed with patients and staff in mind, the unique floor plan gives nurses a clear view of patients’ rooms, allowing for more adequate, hands-on care. Set for completion in 2015, the University of Connecticut Health Center is on track to receive LEED Silver certification for its state-of-the-art Ambulatory Care Center. Located in Farmington, the facility, designed by HDR Architecture Inc., has been planned to enhance patient experience through an intuitive floor plan and areas to relax and reflect. The structure’s notable features include gardens and roof decks to increase patient exposure to sunlight and nature, as well as energy efficient lighting and plumbing to decrease water and electricity costs. Located in Philadelphia, the Perelman Center for Advanced Medicine was designed by Rafael Viñoly Architects with Perkins Eastman, and includes plans for future expansion of the university’s medical campus. With LEED Silver certification, the structure includes a reflective roof, bicycle parking, and electric car-charging stations. Perhaps the building’s most notable feature is a glass atrium, which houses offices and conference rooms and serves as the structure’s centerpiece. Winner of the Pennsylvania Council of Society of American Architects Design Award, the facility was built exclusively with wood from sustainable forests and locally sourced steel. In conjunction with healthcare design authorities CannonDesign, Rafael Viñoly Architects created this 10-story facility that has been lauded by many as the “hospital of the future.” The 1.2 million square foot facility includes a unique Sky Lobby, which features floor to ceiling glass walls and houses the primary reception area and patient waiting space. The facility also has a Wolfgang Puck Express as well as unique food options that work in conjunction with local vendors to create fresh meals for patients, visitors and hospital staff. Designed by CannonDesign, Froedtert and the Medical College of Wisconsin Clinical Cancer Center is a stunning, glass-wrapped structure devoted to the study, prevention, and treatment of cancer. Containing nearly 340,000 square feet, the facility offers views of neighboring wetlands and a central glass atrium, which allows natural light to welcome visitors. Hoping to create an elegant and intuitive space, designers took note of the site’s location, neighboring roads, and natural setting. Composed of glass, the facility’s use of daylight creates a warm and inviting environment to aid in healing and promote health and recovery. Inspired by the structure of the brain, CannonDesign organized the Neuroscience Center of Excellence into sections dependent upon specific brain functions. The north portion of the facility houses hospital clinics, which represents the “rational” portion of the brain; the south end of the building houses a care center for patients, representing the “emotional” part of the brain. Patterns and colors that signify neurons, PET scans, and cellular formations appear throughout the facility. The center has also been awarded LEED Gold certification and ABBY Award Citation of Excellence. Innovation and collaboration function as touchstones for the Behavioral Health Pavilion and Crisis Response Center at the University of Arizona Medical Center. Designed by CannonDesign, the facility combines inpatient psychiatric housing, court hearing rooms, and an emergency care center. It offers a cohesive approach to mental health care and substance abuse treatment. With numerous accolades, including an Award of Excellence from the AIA Academy of Architecture for Justice and an Award of Merit from the Society of American Registered Architects, the facility acts as a model for behavioral healthcare through its warm and calming interior design and its dedication to patient support and care. Image SourceSet for completion in 2018, the Centre hospitalier de l’Universite de Montreal (CHUM) has already won numerous awards including the North American Project Bond Deal of the Year Award from Project Finance International and the Gold Award for Project Financing from the Canadian Council for Public-Private Partnerships. On track to receive LEED Silver certification, the facility includes a large underground parking structure with access to the city’s subway system, as well as open spaces and fine art placement throughout. Contained within two city blocks, the hospital was designed by CannonDesign in conjunction with DCYSA Architect + Design. Just north of Port au Prince, Haiti, University Hospital in Mirebalais is the world’s largest hospital with the ability to be run exclusively on solar energy during peak daylight hours. Courtyards, gardens, and open-air waiting rooms can be found throughout the facility to help promote infection control and reduce disease transmission. An onsite wastewater treatment facility helps reduce cholera, and local artisans contributed many design elements including the metal decorative frames featured at the facility entrance. Opened in 2012, and designed by Jacob Wahler, the hospital is Haiti’s first teaching hospital. It was funded in part by donations and international aid provided after the devastating 2010 earthquake. Using a modular arrangement, Rafael Viñoly Architects designed a plan for the New Stanford Hospital that allows for ease of future expansion of the facility and includes numerous open spaces. Replacing the existing hospital structure that was built in 1959, the new facility will meet updated seismic standards as well as provide a more open and light-filled environment to welcome patients and their families. The project is part of a larger campus-wide rejuvenation plan that includes an expansion of the current Lucile Packard Children’s Hospital, the Hoover Pavilion, and the Stanford School of Medicine laboratories. The facility is scheduled to open in 2018. On track for completion in 2017, the Medical and Research Translation Building and New Bed Tower at Stony Brook University Medical Center was designed by Pelli Clark Pelli Architects. It includes the renovation and expansion of the university’s existing facility. Unifying the medical school’s cancer center with both research and educational facilities allows for interdisciplinary research and collaboration between departments. Originally built in the 1960s and updated over subsequent years, the facility includes both old and new structures including a glass envelop that compliments elements of the original tower structure, designed by Bertrand Goldberg. Located in Honolulu, the John A. Burns School of Medicine at the University of Hawai’i was designed by Architects Hawaii Ltd., and was completed in 2008. With a design focus on traditional Hawaiian imagery and healing, the facility stands as a testament to the school’s innovative medical education program. Receiving multiple awards, including the Public/Government Project of the Year from NAIOP-Hawai’i, and an ASID Award of Merit, the building has also received LEED certification. Lowered operating costs and a focus on creating a healthy work environment contribute to the building’s sustainability features as well as a motion detection lighting system and the use of green cleaning products by facility staff. 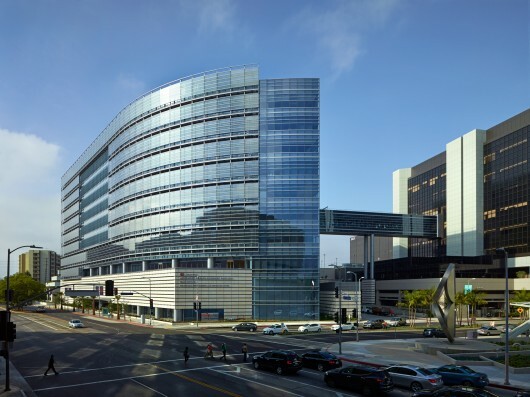 Set to open in 2015, the UCSF Medical Center at Mission Bay was designed through collaboration between Anshen + Allen and William McDonough Partners. On track to receive LEED certification, the facility’s notable features include 16 gardens and over an acre of rooftop landscaping. The center will have the world’s largest amount of green space in an urban hospital and each garden’s organization will address specific patient’s needs. Utilizing environmentally responsible materials and incorporating daylight and fresh air throughout the structure, the hospital administration and staff envisions a place where patients can relax, grow, and heal in a healthy setting. Utah’s first LEED Gold certified medical center, the South Jordan Health Center is a dazzling mass of fretted glass and steel. With an interior atrium and large open spaces throughout, designers Dixon and Associates sought to create an inviting medical facility that reduces patient and family anxiety. Part of the University’s 50-acre medical campus revitalization project, the 210,000 square foot structure features low VOC materials and a waste reduction program that seeks to recycle 90% of the facility’s medical disposables. Children’s of Alabama Benjamin Russell Hospital for Children is the state’s largest hospital to achieve LEED Gold certification and is the nation’s third largest pediatric hospital. Through creative collaboration between Giattina Ayock Studio and Partnership HKS Inc., the facility has won numerous design awards including the Most Innovative Glass Curtain-Wall Project from Glass Magazine and Honorable Mention in the Healthcare Design 2013 Architectural and Interior Showcase. Aside from the stunning glass facade, the building’s sustainability features include the use of recycled building materials, a rooftop garden, and the use of LED lighting throughout the structure. Designed to inspire and comfort its young patients, HKS Architects sought to create a facility that offers children and their families an engaging experience through natural, artistic, and cultural interior elements. Located in Ann Arbor, the 1.1 million square foot C.S. 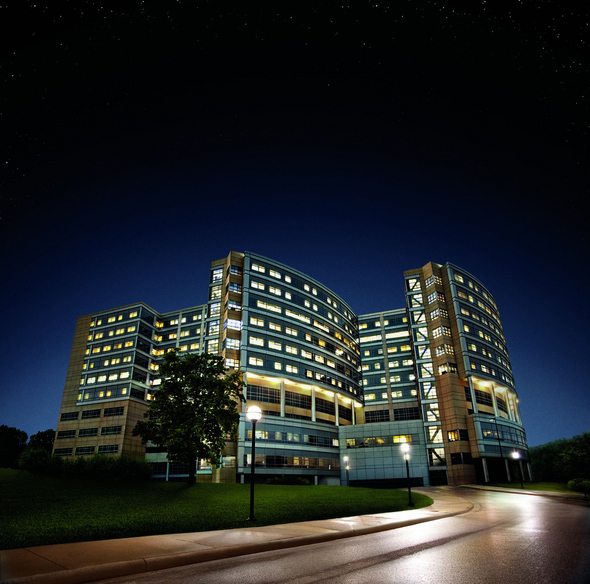 Mott Children’s Hospital and Von Voigtlander Women’s Hospital has received LEED Silver certification. It also features a unique art collection that showcases work by local artists as well as children. Notable design features include a toy telephone system for children to converse with each other between rooms, murals, play areas, and visual access to the site’s neighboring Nichols Arboretum. Scheduled to open in 2017, the University of Maryland Shore Regional Medical System will replace the 100-year-old existing hospital structure offering a much needed updated to include 126 private patient rooms and ample access to natural light. World-renowned healthcare design specialists HKS carefully considered the site’s location within Chesapeake Bay’s shore and neighboring farmlands during initial planning stages. The project is currently on track for LEED Silver certification. Notable design features include individual room climate, light, sound control, access to daylight, natural ventilation, and an improved finding system. Winner of the AIA American Academy of Architecture for Health National Design Award in 2009 and the AIA Pasadena and Foothill Chapter Honor Award in 2006, the Peter O. Kohler Pavilion at OHSU opened in 2009. It includes a unique design that utilizes the site’s complex typography. Located on a southwest Portland hillside, the facility houses 11 floors and over 330,000 square feet. It features courtyards, gardens, and regular access to natural light. Within close proximity to bicycle and walking paths, the Pavilion’s giant glass windows and terraced healing and meditation gardens provide patients and their families with a connection to nature within the hospital’s walls. With views of the southwest waterfront and a prominent place in Portland’s skyline, the Kohler Pavilion offers some of the nation’s top medical care in one of the region’s most elegant facilities. A breathtaking desert setting gives patients at the Peter and Paula Frasseas Cancer Clinic an opportunity to relax and heal while surrounded by some of Tuscon’s most beautiful natural views. Once an abandoned hospital site, the new facility emerged from part of the former 50-year-old hospital’s foundation and steel frame. CO Architects coupled gardens, trees, and courtyards with mountain and desert views to create a space of patient refuge. Awarded the AIA Academy of Architecture for Health Design Award in 2008 and the AIA Modern Healthcare Award of Excellence in 2007, patients and staff were consulted and involved with the facility’s design, which included requests for access to daylight, especially during long cancer treatment therapies. A resource library and cafe are also located onsite. Housing both a research pavilion and clinics, the Cedars Sinai Advanced Health Sciences Pavilion was awarded an AIA California Architecture Merit Award and an Architecture Healthcare Award from the Los Angeles Building Council. Affiliated with the David Geffen School of Medicine at UCLA and the California Heart Center at USC, the facility was designed by HOK and houses one of the most advanced research centers on the West Coast. The 800,000 square foot facility has received LEED Gold certification. It includes energy saving features and access to ample light and air to aid in patient healing and reduce dependence on conventional energy sources. Affiliated with the University of Vermont, the Fletcher Allen Health Care Renaissance Project originated from a need to create a cohesive medical campus that included clinical research and educational facilities. Designed by Tsoi/Kobus and Associates, the building was one of the first in the United States to utilize a sustainable design. Winner of numerous accolades including the Healthcare facilities Design Award by the Boston Society of Architects, the Coverings 2007 Prism Award of Merit for Commercial Buildings, and Award Citation for Built Projects from Modern Healthcare, The Renaissance Project offered a much needed update the campus’ aging 19th century buildings. New construction onsite increased the facility’s square footage by 680,000 square feet and over 1,000 parking spaces were added to the underground garage. Designed by NBBJ to achieve LEED Gold certification, the Bellevue Clinic and Surgery Center has been awarded a Merit Award from AIA Seattle, Best of the Year, Healthcare from Interior Design Magazine, and an AIA BIM Award for Delivery Process Innovation. In conjunction with the University of Washington Department of Pediatrics, designers carefully considered all aspects of a pediatric surgery experience. Hoping to create a space that offers children and their parents a sense of calm, NBBJ utilized multiple skylights, age-appropriate artwork installations, and access to rooftop gardens. Designers also reduced patient contact with potentially threatening medical equipment and enhanced natural light. The use of sun shading and an energy efficient HVAC system help reduce dependency on traditional means of energy consumption and decrease hospital costs. Awarded the 2006 Modern Healthcare/AIA Design Award Citation, and the 2007 Contract Interiors Award Winner for Healthcare, the University of Wisconsin Cancer Center at Johnson Creek utilizes glass, natural light, and a soft color palette to create a warm and inviting hospital environment. Situated within a rural landscape, ample windows allow for the enjoyment of the natural setting and can potentially contribute to patient healing and anxiety reduction. Designed by OWP/P and inspired by a desire to create a facility that counteracts the often frightening process of treating cancer, designers used materials that reflect the natural environment and include visual access to the sky above. The facility’s primary design focus encourages a sense of calm and healing through its innovative use of the surrounding landscape. Designed by Perkins + Will, Savannah, Georgia’s William and Iffath Hoskins Center for Biomedical Research was designed as a translational cancer facility and opened in 2006 as part of the Memorial Health University. The two-story building offers 30,000 square feet of space and includes floor to ceiling windows to enhance exposure to natural light. Affiliated with the Mercer University School of Medicine, the design also features two exterior reflecting pools near the building’s entrance as well as state-of-the-art cancer research and treatment facilities. Dedicated to creating an environment that promotes “bench to bedside,” research and care, the Hoskins Center is one of the few facilities in the United States facilitating research on the molecular genetics of cancer. Part of the Dartmouth-Hitchcock Medical Center, The Center for Surgical Innovation, designed by Payette, offers cutting-edge research equipment and a facility that offers medical imaging and image-guided research. Moveable CT and MR imagers align along a track that spans the length of the facility and allows for both human and animal procedures. With the help of a state-of-the-art ventilation system, cross-contamination between subjects is minimized. The facility’s notable features include the daVinci robotic system, as well as an inter-operative suite, and staff gardens to promote relaxation and inspire innovation. Located in Neptune, New Jersey, the Jersey Shore University Medical Center (JSUMC) has been given numerous awards including the International Health Project at the design and Health International Academy Awards 2010, as well as a Citation of Merit Award from Healthcare Design Magazine. Designed by WHR Architects, the facility includes a glass atrium entrance, the use of soothing colors and fabrics, and roof gardens that can be seen from patient rooms. Natural light and use of sound reducing materials helps keep patients and their families comfortable. Known as the Transforming Care expansion, the project focuses on a patient care-based design and includes the Northwest Pavilion, an inpatient center divided into “neighborhoods” of 36 beds to maximize efficiency and collaboration.